The Lenovo ThinkSystem ST250 is a mainstream 1-socket tower server that also be rack mounted as a 4U rack server. It is ideal for small-to-medium businesses, remote offices, branch offices, banking and public sector. This product guide provides essential presales information to understand the ThinkSystem ST250 server, its key features and specifications, components and options, and configuration guidelines. This guide is intended for technical specialists, sales specialists, sales engineers, IT architects, and other IT professionals who want to learn more about the ST250 and consider its use in IT solutions. The Lenovo ThinkSystem ST250 is a mainstream 1-socket tower server that also be rack mounted as a 4U rack server. It is ideal for small-to-medium businesses, remote offices, branch offices, banking and public sector. The server supports one Intel Xeon E-2100 Series processor (formerly codenamed "Coffee Lake") and up to 64 GB of 2666 MHz TruDDR4 ECC memory. 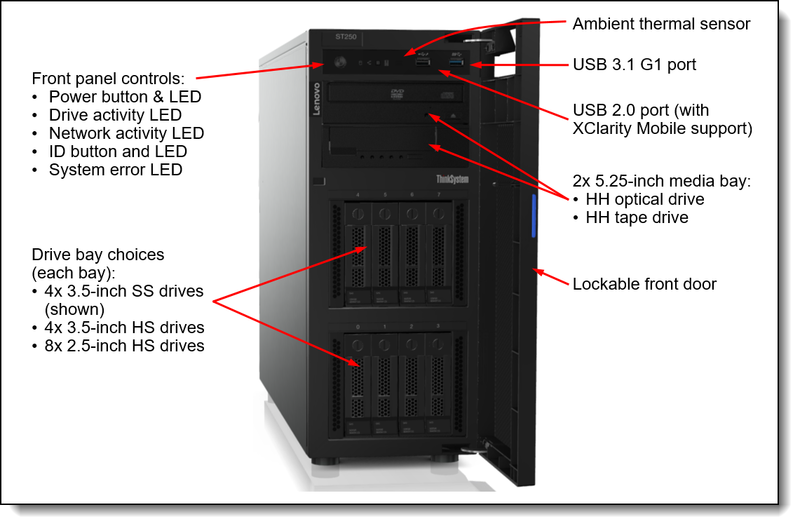 Figure 1 shows the Lenovo ThinkSystem ST250. The ThinkSystem ST250 is an enterprise-grade server with enterprise-level management features and support for hot-swap power supplies and drives. It offers full support of Lenovo XClarity Administrator for comprehensive systems management and includes the next generation UEFI-based Lenovo XClarity Provisioning Manager for system setup and diagnosis, and the Lenovo XClarity Controller management processor for ongoing systems management and alerting. These tools make the ST250 easy to deploy, integrate, service, and manage. 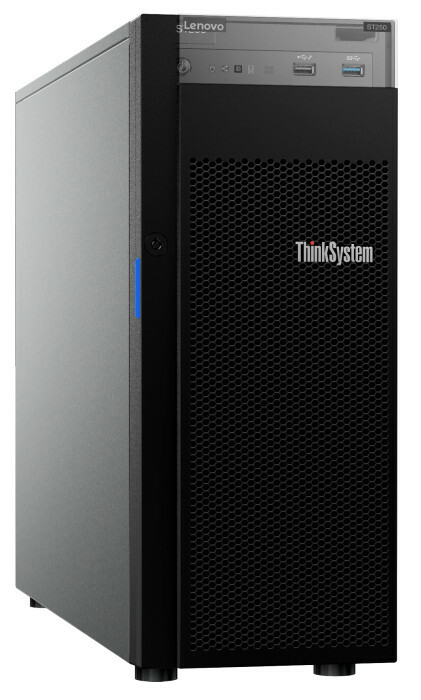 The ThinkSystem ST250 is a office-friendly tower server that has been optimized to provide enterprise-class features to small businesses, retail, educational institutions and branch offices. Flexible storage configurations support either 2.5-inch or 3.5-inch hot-swap drive bays or a combination of the two (hybrid configuration). Drive bays support SAS and SATA HDDs and SSDs. Offers two 5.25-inch media bays with support for optical drives or backup drives. Supports a single M.2 drive as an additional storage/boot device. Support for a NVIDIA graphics processing unit (GPU) to enhanced graphics. The ST250 supports UDIMM memory with ECC protection which provides error correction not available in PC-class "servers" that use parity memory. Avoiding system crashes (and data loss) due to soft memory errors means greater system uptime. Much like hot-swap drives, simple-swap drives are mounted on an easy-to-remove tray and work with the same RAID options. Simple-swap require a system power-down before adding or replacing, however simple-swap drives are less expensive than hot-swap drives. 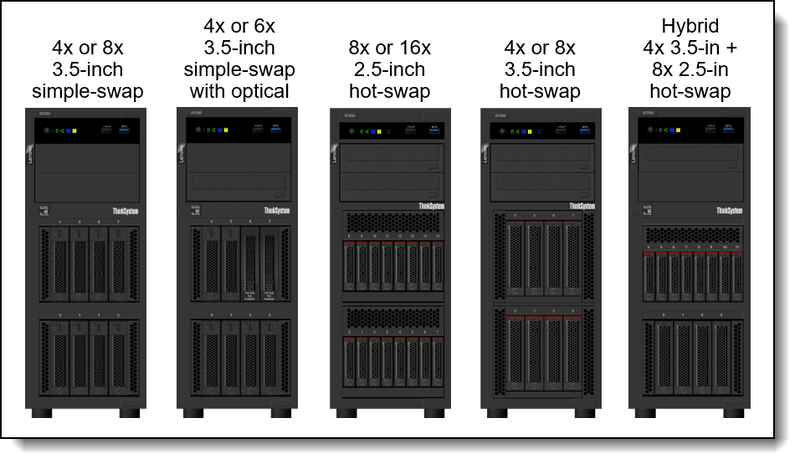 The server supports hot-swap power supplies; with two installed, they form a redundant pair to provide availability for business-critical applications. Physical security measures to prevent unauthorized access: Loop for a padlock to prevent the side panel from being opened and a slot at the rear of the server for a Kensington Cable Lock. Optional additional physical security features are a lockable front security door and a chassis intrusion switch (included in some models). 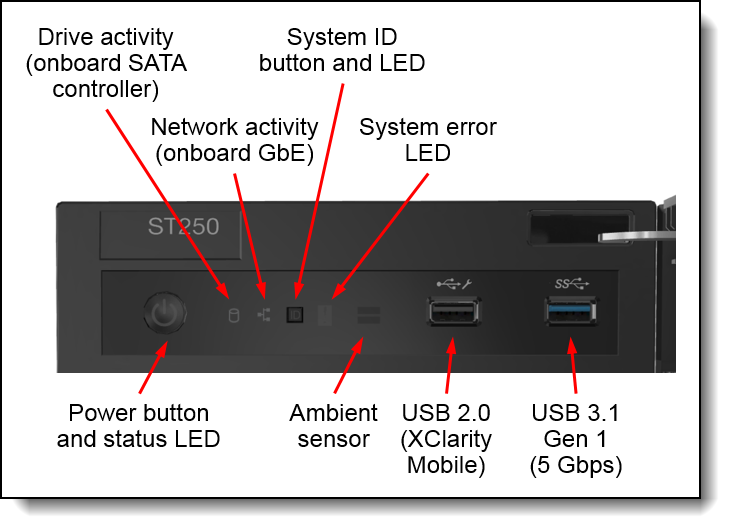 The following figure shows the architectural block diagram of the ST250, showing the major components and their connections. A closer look at the SATA ports for use with SATA drives, optical drives and an M.2 drive, see the Internal storage section. Memory Four DIMM sockets supporting Lenovo TruDDR4 DIMMs at 2666 MHz. Support ECC UDIMMs. In addition, the ST250 supports one M.2 Drive via an onboard connector. Note: If the onboard SATA controller is used to connect the drive bays, then only 6 drives can be installed if an M.2 drive is installed. Optical drive bays Two half-height 5.25-inch bays for optical or tape drives. Supports SATA DVD-ROM or DVD-RW (multiburner). Note: If the onboard SATA controller is used to connect the drive bays, then only 6 drives can be installed if an optical drive is installed. Tape drive bays Two half-height 5.25-inch bays for optical or tape drives. Support for one RDX drive or one LTO tape drive. Network interfaces Two integrated Gigabit Ethernet 1000BASE-T ports (RJ-45) based on Broadcom BCM5720 embedded controller, one can be shared with XCC for systems management. Third dedicated Gigabit Ethernet port for XCC systems management. Cooling Supports ASHRAE A2 environments. Certain configurations support ASHRAE A3. Two or three fixed system fans depending on the drive bay configuration. Additional fans attached to the processor heat sink and in the power supplies. One fixed power supply, 250W. 80 PLUS Platinum certified. Two redundant hot-swap power supplies, each 550W. For China customers, the 550W power supplies support 240V DC input. 80 PLUS Platinum certified. Energy Star 2.1 compliant. Security features Power-on password, administrator's password, Trusted Platform Module, supporting TPM 1.2 or TPM 2.0. In China only, optional Nationz TPM 2.0 module. Optional chassis intrusion switch. Padlock loop and Kensington cable slot and optional lockable front door for physical security. * A maximum of 6 drives can be installed in configurations that have the onboard SATA controller and have an internal optical drive installed. The ST250 supports one processor from the Intel product family formerly known by the codename "Coffee Lake". This includes processors from the Intel Xeon E, Core i3 and Pentium families. Integrated graphics and management: Many of the processors supported by the ST250 include integrated graphics, however, this functionality is not used by the server. Instead, graphics support is provided by XClarity Controller (XCC), or by an GPU add-in card. Similarly system management of the ST250 is handled by XCC and as a result, the AMT management processor is disabled. The ST250 server supports Lenovo TruDDR4 memory. TruDDR4 memory uses the highest-quality components sourced from Tier 1 DRAM suppliers and only memory that meets strict requirements is selected. It is compatibility-tested and tuned to maximize performance and reliability. The ST250 supports up to 4 DIMMs. 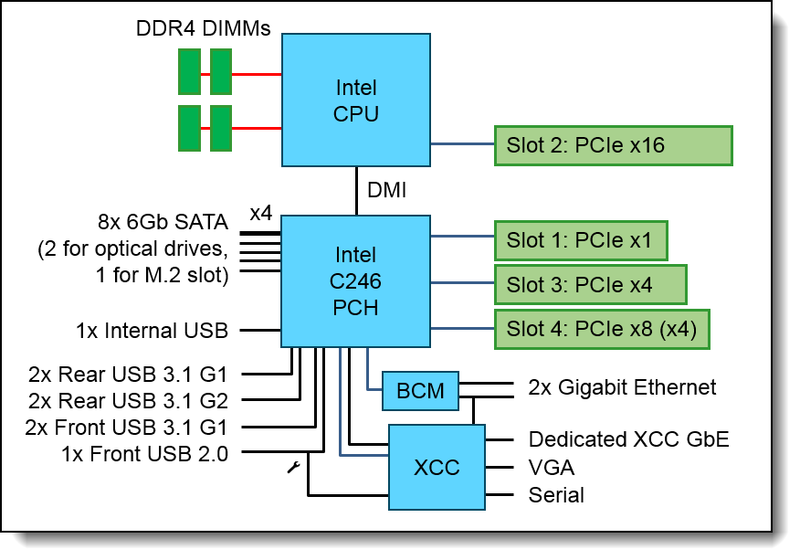 The processors have 2 memory channels and support 2 DIMMs per channel. The following table lists the memory options that are available for the ST250 server. The ST250 supports 2.5-inch hot-swap, 3.5-inch hot-swap, and 3.5-inch simple-swap drives in a variety of drive bay configurations. A combination of 8x 2.5" hot-swap and 4x 3.5" hot-swap drives. Hot-swap configurations SAS and SATA drives depending on the controller used (the onboard SATA controller supports SATA drives only). Simple-swap drive configurations support SATA drives only. NVMe PCIe drives are not supported with any configuration. The different drive bay configurations supported are shown in the following figure. The server also supports one M.2 drive, installed in a slot on the system board as shown in the internal view of the server. 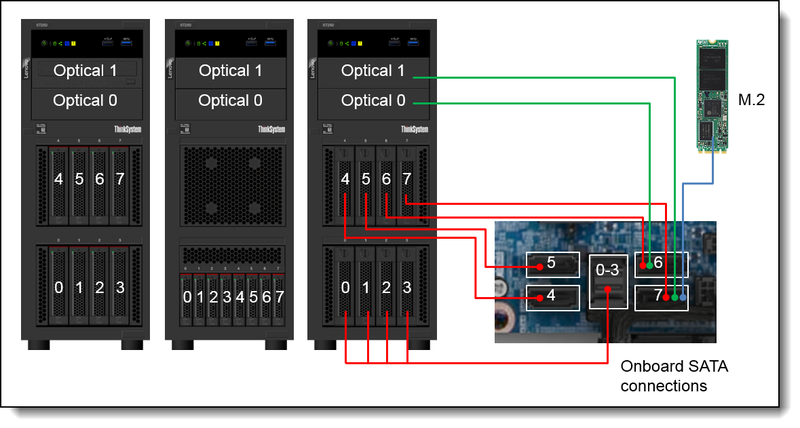 If the onboard SATA controller is used, then up to 8 drives can be connected (hot-swap or simple-swap) provided no optical drive or M.2 drive is installed. If the onboard SATA controller is used in RAID mode and an M.2 drive is installed, the M.2 cannot be used as a boot device to boot Windows. The ST250 has an onboard SATA controller for drive, optical drive and M.2 connectivity. For the drives, connections are via 5 connectors on the system board: four single-lane SATA connectors and one mini-SAS HD connector with 4 lanes. SATA ports 0, 1, 2 and 3 are connected to the first 4 drive bays (bays 0-3). These are routed to a single mini-SAS HD connector on the system board. SATA port 6 is either connected to drive bay 6 or optical drive bay 0 (lower bay). SATA port 7 is either connected to drive bay 7 or optical drive bay 1 (upper bay) or to the onboard M.2 connector. When an M.2 drive is inserted into the M.2 connector, it automatically connects to the SATA port and any connected drives (drive bay 7 or ODD1) are automatically disconnected. The ST250 also supports the use of a RAID adapter or SAS host bus adapter to support the use of SAS drives plus offering higher performance features and RAID functionality. It is not supported to add 2x SATA optical drives + M.2 drive to a RAID adapter or HBA configuration. 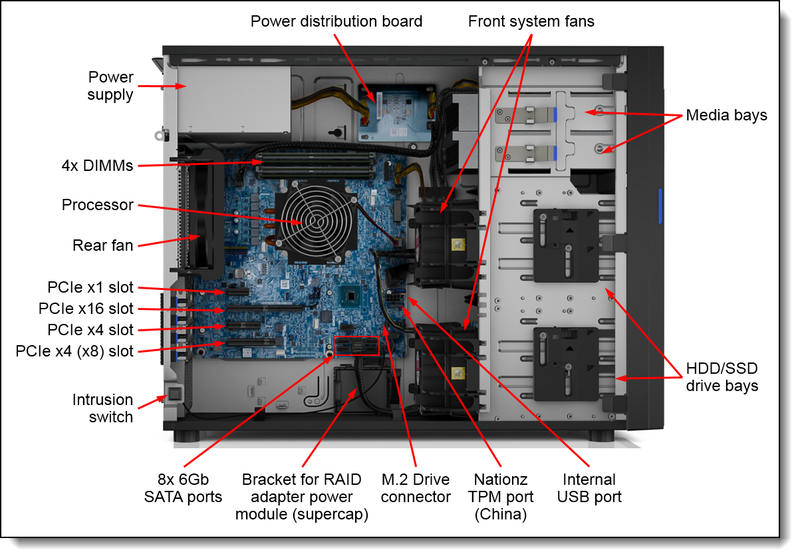 The following table shows the upgrades you can perform to the ST250 after initial purchase to add additional drive bays or to change the controller. If you are planning to do a field upgrade to add a RAID adapter or HBA for connectivity to the drives, you will need to order the RAID/HBA Cable & Flash Module Mechanical Kit, 4Z57A14087. This kit contains the cable which connects the adapter to the four SATA drives, replacing the existing four SATA cables. For the RAID 930-8i adapter, the kit also contains the bracket for the RAID adapter's flash power module. For CTO and preconfigured models in the configurator tool, the cable and flash power module bracket are automatically added if needed. The following table lists the contents of the cable and backplane kits needed for the upgrades. The ST250 server supports one M.2 form-factor SATA drive. 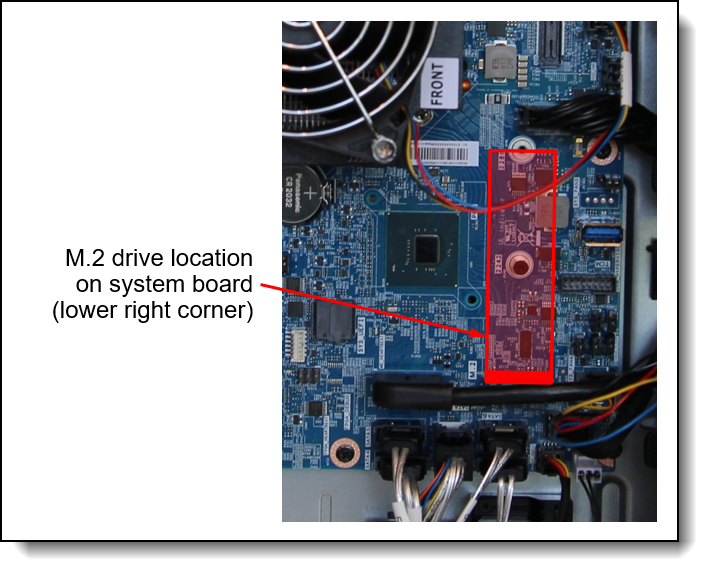 The M.2 drive is installed in a slot directly on the system board as shown in the following figure. With an M.2 drive installed, if the onboard SATA controller is used to connect 2.5" or 3.5" drives, then only six drives can be installed. The other two drive bays must remain empty or disconnected. Only one optical drive can be installed if an M.2 drive is used. The use of two optical drives + M.2 is not supported. With an M.2 drive installed, if the onboard SATA controller is used to connect 2.5" or 3.5" drives and the controller is in RAID mode, then the M.2 cannot be used as a boot device to boot Windows. Configurations with an M.2 drive + optical drive + backup drive (either RDX or tape) is only supported as a field upgrade. Such configurations are not supported configure-to-order (CTO). Tip: The ThinkSystem M.2 Enablement Kit and ThinkSystem M.2 with Mirroring Enablement Kit that are supported in other ThinkSystem servers are not supported with the ST250. 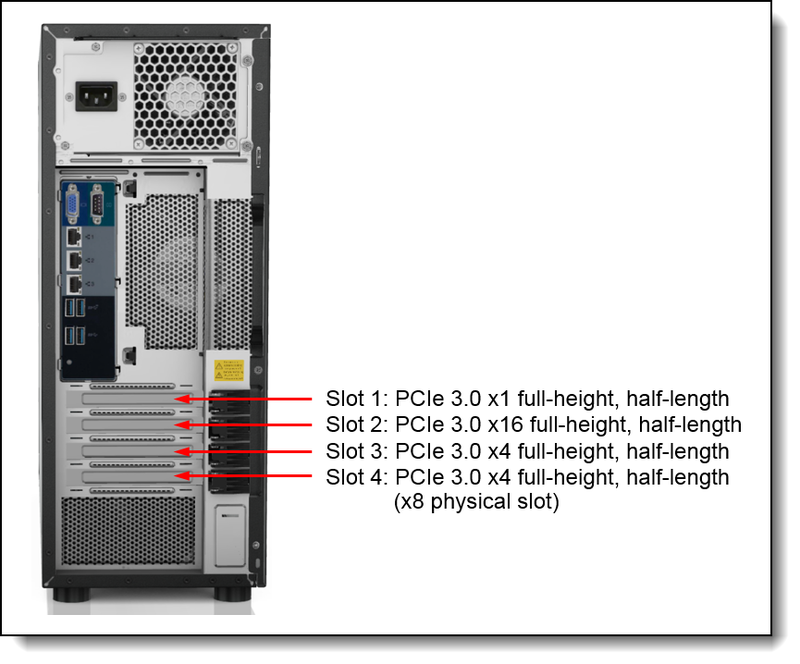 The ST250 uses two onboard 6Gb SATA ports to connect the four or eight drives. Hot-swap and simple-swap SATA drives are supported. These onboard SATA ports support RSTe mode for RAID functionality or AHCI mode for JBOD support. Windows support: Windows only supports a RSTe-based RAID array of no more than 6 drives. In addition to the onboard SATA controller, the ST250 with hot-swap drives supports the use of an internal RAID adapter or HBA. The following table lists the supported adapters. The ST250 supports the internal backup unit options that are listed in the following table. The RDX drive is attached via the internal USB 3.0 port on the system board. The USB cable ships with the drive. The use of an LTO tape drive requires a SAS HBA, either the 430-8i or 430-16i SAS/SATA 12Gb HBA. Details about the adapters in the SAS adapters for external storage section. The SAS cable ships with the tape drive. The ST250 supports the optical drive options listed in the following table. The internal optical are installed in the 5.25-inch media drive bays. For configurations using the onboard SATA controller, if 1 or 2 optical drives are installed, only 6 HDDs or SSDs can be installed. The ST250 has two onboard Gigabit Ethernet ports, connected to a Broadcom BCM5720 embedded controller. * Requires transceivers or DAC cables that must be ordered separately. The ST250 server supports the graphics processing units (GPUs) listed in the following table. The ST250 has the following fans. All fans are fixed (non-hot-swap). The power supplies are auto-sensing and support both 110V AC (100-127V 50/60 Hz) and 220V AC (200-240V 50/60 Hz) power. In China only, the 550W power supply also support 240V DC. Both 250W and 550W power supplies are 80 PLUS Platinum certified. The 550W hot-swap power supply is Energy Star 2.1 compliant. 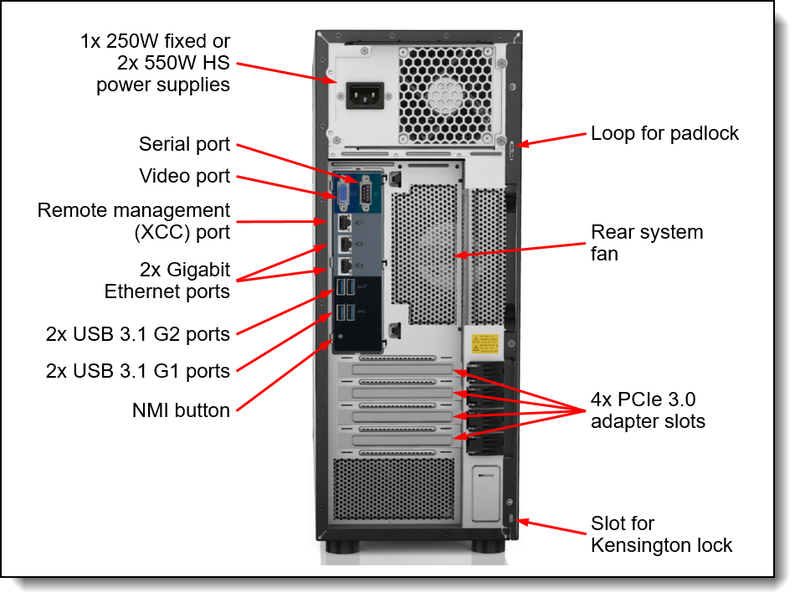 The following table lists the maximum configuration for the 250W power supply. The ST250 contains an integrated service processor, XClarity Controller (XCC), which provides advanced service-processor control, monitoring, and alerting functions. The XCC is based on the Pilot4 XE401 baseboard management controller (BMC) using a dual-core ARM Cortex A9 service processor. The ST250 offers a front operator panel showing key LED status indicators, as shown in the following figure. The Nationz TPM module is installed in a dedicated socket on the system board. See the Components and connectors section for locations of physical components. For configure-to-order configurations, the server can be preloaded with VMware ESXi installed on an M.2 card. Ordering information is listed in the following table. The server can operate in ASHRAE A2 environments (10-35°C).